Your First Free Pilates Tip: Not just exercise but a concept. Pilates is not just another form of exercise it is more of a conceptual approach to movement. The techniques and principles behind Pilates can be taught in many different ways and for many different reasons. Pilates exercises can help you achieve all of the above. Your Second Free Pilates Tip: "Mind over Motion"
With Pilates, every movement is a conscious act controlled by the power of your mind. In Pilates exercises, the focus is on every movement as you perform them connecting mind with body. Doing this will help the Central Nervous System become accustomed to choosing the right combination of muscles to perform each exercise. When you consciously learn to perform the seemingly simple Pilates Principle and fundamental movements your mind is learning correct movement patterns that will carry over into more advanced exercises, as well as into your daily life. When you practice by using your conscious mind during exercise only then will you see improvements in your posture and balance. Subconsciously as you move through the day you will stand taller and walk and move with more confidence, everyone will notice! Remember, I used to be a slouch and now people actually ask me if I'm still growing! I have to tell them "No, I just stand up straight because the muscles supporting my spine are stronger through practicing Pilates exercises." Your Fourth Free Pilates Tip: Focus on your core or center of the body. The center of your body is your powerhouse. This is the place from which all motion originates and then proceeds to the extremities, all working in unison not as separate parts. Ultimately every movement should be initiated by first contracting the core strengthening muscles or the "powerhouse". Strong abdominals are the key to your body working as a unit. But they must be the deeper layered abdominal muscles not the superficial six pack abs. Your Fifth Free Pilates Tip: Continuous Movement. All Pilates movements are continuous; they have no beginning and no end. Pilates is slow, graceful, and controlled such as Tai Chi. See how the movements flow together in this Pilates DVD for Healthy Back and Joints. Pilates movements are different than other exercises in that there is no required number of repetitions. Each movement is a long, continuous cycle that requires greater skill to control as you move more slowly. By using muscles in this way, you will begin to develop strength and flexibility in equal measure, giving your muscles and body a long, lean look. To begin putting your free Pilates tips to use right away check out the new Pilates ebook and start changing the way you look and feel right now! 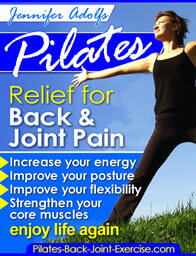 Leave Free Pilates Tip and get started doing Pilates now with the new ebook here!